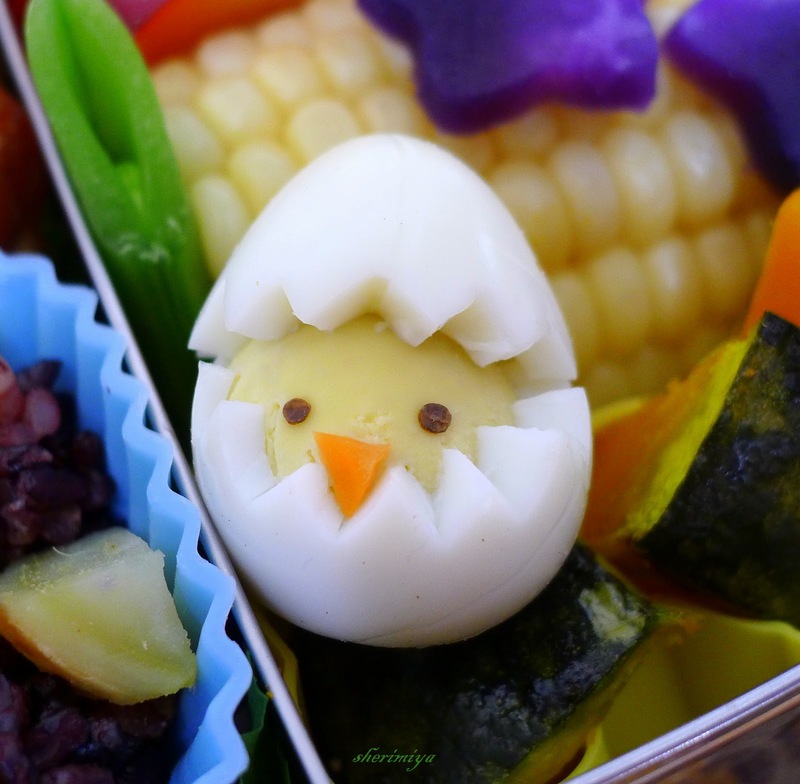 Mochiko Chick'n Bento, a photo by sherimiya ♥ on Flickr. I made oven-roasted mochiko chicken today (see recipe and method here) and tossed some sliced kabocha wedges in there as well. There's also something in this bento that I don't usually pack. Do you see it? That's right: rice! I got the idea for satsumaimo rice from Hapa bento's Okinawan sweet potato gohan post. I cooked a mix of black and brown rice, then tossed with diced satsumaimo (Japanese sweet potato) which I had tossed in the rice cooker whole midway through the cycle. I cut the imo after cooking, then gently folded into the rice. After packing the peapods, red plum, corn on the cob and Okinawan sweet potato stars, I had a little spot for a tiny hard-boiled quail egg chick. I cut the "eggshell" white with my small paring knife tip, and added nori eyes and carrot beak to the yolk "chick". I have a container of precut nori eyes and such, so that I can just use what I need right away. Too late, I just noticed that the two dots are different sizes. Oops. Still cute though, right? This little chick is such a cute thing!!! She's (he's?) trying to hide or something.. haha good expression on her/his face! I've never asked you... Are your parents or grandparents from Okinawa? 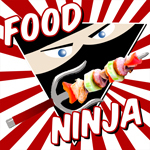 I see you use a lot of Okinawan food and I realized I've never asked you! Another delicious obento! I think the chick is adorable and very well done. This bento is very colorful. I love the purple stars on top of the corn. This is just the right combination of everything to fill you up at lunch! It's also so easy on the eyes too, so cute!Sometimes do you wonder if your kids open up their bento lunch and go, "hm.. what to eat cute first?".. lol. This is the Real Happy Meal. Since I have hard boiled and peeled quail eggs on multiple occasions I am SUPER impressed!!! They sure are challenging little buggers to make into deviled eggs. I can't image getting creative with them like this! For those that don't know, quail eggs are smaller than a quarter. 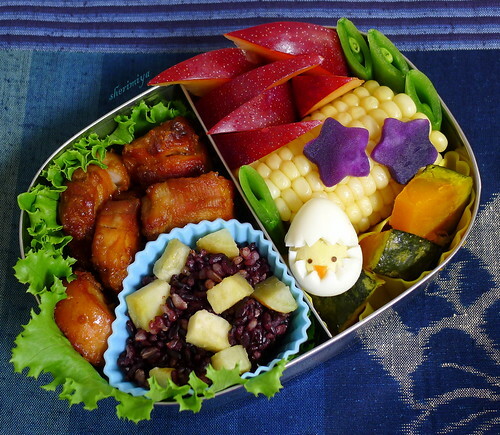 That's a colorful and delicious looking bento! The chick is so cute and I like those purple sweet potato stars. Unfortunately I have not seen purple sweet potatoes at the grocery stores here. Thanks Biren! I think we eat Okinawan sweet potatoes every day; love them. We also have regular non-sweet purple potatoes - perhaps you can find those. They taste just like white potatoes but are much prettier.